Anytime you visit a troop with the intention of joining, you should ask questions about that troop to make sure that it is the best place for you. Here are answers to several questions you should ask about any troop. How often has your Troop achieved Quality Unit Status in the last 5 years? Is your Troop "boy-run" or "adult-run"? Boy run with adult oversight and veto capability. How many registered leaders are there? What is their attendance history at regular meetings and on outings? We average 8+ registered leaders at regular meetings and 5+ registered leaders on outings. How do you handle newcomers? Newcomers who do not join in the early spring with the graduated Webelos Cub Scouts are put in an age appropriate patrol. When graduated Webelos join in a group, a new patrol is formed for those boys. The leadership is rotated within the patrol on an accelerated schedule (quarterly) to give each new scout a chance to experience leadership. This also allows us to work on advancement within the new patrol that is appropriate for all the scouts. What is the boy to leader ratio at meetings and on outings? 4 to 1 is a fairly normal scout to adult ratio. Do you have an active outdoor program? How many days/year are spent camping? Where? What are the plans for summer camp? We camp every month except December. See the calendar for details. We attend a week of summer camp (Ransburg) every year, usually in July. What is your philosophy on uniforms? Scouts must have a class A dress shirt. Scout pants, belts, shoes, socks are optional. We also allow a class B shirt for many events. How are new Scouts going to learn what to do as Boy Scouts (camping skills, patrol activities, advancement, etc.)? Will they have an experienced adult leader working with them? We assign an experienced older scout to work with the new Scouts as well as an adult leader. They work with the boys during the first year to help them advance and learn the ropes. What is the typical troop meeting like? Most meetings are divided into 3 phases - planning, advancement, game. During planning, we discuss and plan upcoming events and activities. Advancement time is spent working on scout skills or working on a merit badge. If time permits a troop game is played. What is your philosophy regarding advancement (at what pace are the ranks earned)? This depends almost entirely on the individual scout. We encourage and provide opportunities to advance as quickly as the boys would like but don't force the scouts to advance. Scouts that attend regularly and pay attention will be able to achieve 1st class rank by the end of their first year. Those that are interested in Eagle have routinely achieved that rank in the last few years by the age of 16. What kind of program do you have for the older scouts? Are there any High Adventure Outings? Our goal is to schedule one high adventure outing each summer. In 2008, we went to Philmont Scout Ranch in New Mexico. In 2009 we canoed in the Boundary Waters Canoe Area in northern Minnesota. In 2010 we went to the Florida National High Adventure Sea Base in the Florida Keys. We returned to Philmont and Boundary Waters in 2013, as well as attend the National Jamboree at The Summit Bechtel Reserve. What kind of fundraising do you offer? We have 2 major activities that raise the bulk of troop funds. We sell Christmas trees at the Marsh grocery store (96th St. and Lantern Rd.) during late November and early December and have a food booth at the Fishers Freedom Festival in June. Scouts can also participate in the popcorn sales if the want to. Scouts also participate in the wagon-pull for Conner Prairie's Symphony on the Prairie. Except for popcorn sales and the Conner Prarie wagon-pull, the scouts get to put half of the money raised (divided among the Scouts based on the hours worked) into a Scout account. Scouts keep all of the money earned from individual popcorn sales and wagon-pull proceeds. Scout account funds can be used to pay for scouting related activites such as fees and equipment. The other half goes into the troop fund to pay for equipment and other expenses. What are the financial obligations for each Scout? There are yearly dues paid when a scout first joins and then annually every October. Summer camp (Scout pays for himself and a portion of the adult leadership). We do pay for boys in leadership positions to go to training. Does your Troop have a limitation on size? Do you have written policies? Are the Troop meetings and activities planned? There is a yearly planning meeting where all scouts are invited to help plan activities for the upcoming year. We have a scout Patrol Leadership Council meeting once a month to plan the activities for the next month. This is boy run with adult oversight. There is also an adult leadership meeting following the boy meeting each month. What kind of equipment do you have? Is it in good shape? Do you have enough if Webelos were to join your Troop? We currently have a bus to transport scouts and equipment, and we have all the equipment needed to camp. The boys supply their own sleeping gear and mess kit. 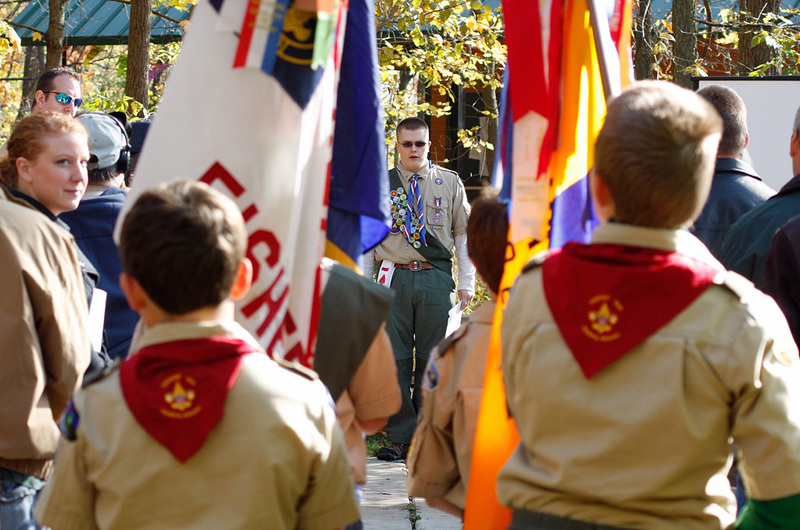 Are your Scouts able to balance Boy Scouts with other activities such as sports, band, church? We have a broad range of participation. Almost all of the scouts are involved in band, sports , church, or some other non-Scouting extracurricular. Those that leave scouts at a low priority tend to advance more slowly (because they aren't present) than those that give scouting more effort. How active is your Troop at District and Council events? We attend all of the District camporees and many of the other District and Council events. How many current leaders are trained? Twenty-two adult leaders are fully trained for their position per BSA requirements. All adult leaders are trained in Youth Protection. What are the expectations/requirements of new adults/parents to this troop - as assistant leaders, committee members, special event chairpersons, event workers, and merit badge counselors? We strongly encourage all families to participate in some way with the troop. There are lots of different ways that they can. Does the Troop pay for any/all adult leader registration and training? Typically this is not an issue. If someone is limited by funding, the Troop will be glad to pay for training. How many leaders routinely attend Round Table Meetings for the Del-Mi District? How do you feel about a Scout (and parent) visiting a meeting unannounced? No problem, although we do set aside some nights where we will be prepared to discuss the operation of the troop more thoroughly with you. On other nights, we may not be able to provide as much interaction. How many Eagle scouts have there been in your troop and how many are there currently? We have 4 Scouts who earned their Eagle rank in 2011. Total - 73 since 1958 - 11 in the last 3 years. About 4 are currently working on their Eagle projects.